Over the summer we went back and re-explored some the Catalan gorges for swimming, along the way we came across details of The Salt de la Caula which is just by Les Escaules, north of Figueres, a little way into the hills by the Muga river. We also read that the gorge was no longer suitable for swimming, but we thought we would take a look and, eventually, found ourselves at a restaurant almost sitting under a 30m waterfall. From what we read the gorge was thermal water and it is still listed as being open in some places, though it's not clear if this is the river above the waterfall, or further downstream. 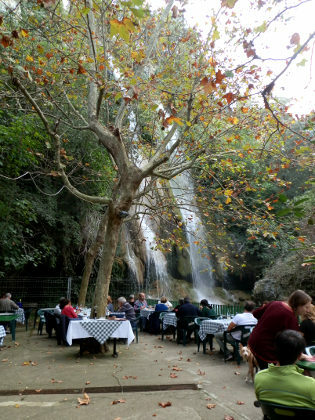 However, at the restaurant, the sign said that there had been a rockfall in 2010 during heavy rain which dropped a lot of rock and stone into the gorge leaving a very pretty waterfall, but taking away the space for swimming. However, before we got to the restaurant we paid a short visit to the castle above Les Escaules and the village itself having actually driven past the waterfall and restaurant parking (just before the turn to the village). We also got a little stuck driving into the village looking for parking - the roads get very narrow with little space to turn around, so if you do visit, park outside and walk in. The most remarkable part of our visit was the landscape which becomes quite dry and barren and what trees are around seem to have been blown over leaving hillsides of low scrub and rock. We parked just outside the village and walked up to the ruins of the castle above the village and the fallen trees are all around, and it seemed odd then to see such a great flush of water coming from the waterfall when we finally found it. The village is a long narrow medieval village with a small church and square situated above the Muga river below. At the lower part of the village by the bridge you can get access to the river for paddling. But to get to the restaurant we had to double back and then could see the waters cascading off the cliff and the noise of the water that we hadn't been able to hear from the car. The restaurant has tables and seating almost directly underneath next to the little stream fed by the water. We sat and waited for a drink (and waited and waited) enjoying the view and the strange sense of such a lot of water in such an apparently dry area. Returning, we carried on the Boadella and then up into the almost Provencal hills to Torrades. Again another surprise and new landscape. Some great walks in such a beautiful area. Would be good to see some a bit nearer the French border but that's just me being selfish as I live in France.